Anyone nicknamed Dopey-- or as the moniker quite nicely translates into Portuguese, Dunga--will be an easy mark for ridicule. 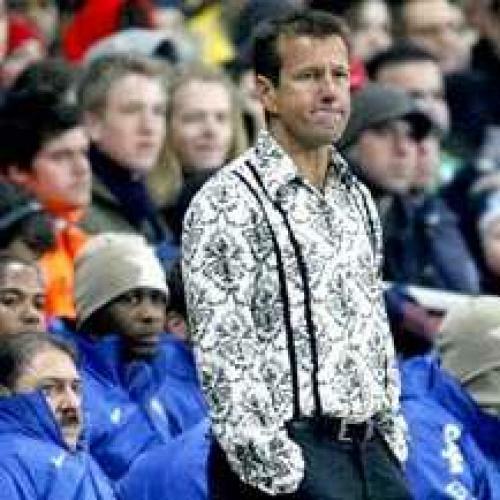 Even Carlos Dunga’s most tender gestures, like wearing attire designed by his daughter to big matches, result in the commentariat doubling over in cruel laughter at his expense. But in this World Cup, he has cut an image that is more villainous than comic. He is cast as the heartless assassin of joga bonito, the mercenary who took a pillow and snuffed the élan out of the Brazilian game. Where Maradona is portrayed as lovably unable to control his appetites and Domench as a hapless buffoon, the biopic of Dunga’s life will star Gary Oldman. His name came early, and one gets the sense that his hard man persona is a reaction against it. Having suffered a childhood full of verbal abuse, he has conditioned himself to expect and even enjoy attacks, as well as the retaliatory occasion. During Brazil’s game against Ivory Coast, he came alive as the match moved into its feisty final minutes--stomping his feet, flailing his arms, encouraging his players to milk their confrontation with the exasperated Ivorians. As a player, Dunga could never perform the cross-over steps or freakish dribbling tricks of his most skilled compatriots. This type of spasm is what defined him. When he became Brazil manager, it was assumed that he would be a caretaker, that he didn’t have the temperament to hold the job over the long-run. This always seemed a bizarre strand of conventional wisdom to me. While I can only recall a few brutal tackles from his playing days, there are the many images of him berating his teammates (Bebeto, you numbskull! ), his goalkeeper (Tafarel, you butterfingers!) and his managers even (return to your nap, Zagallo!). He was the most imperious player of his generation; Roy Keene had a clearer sense of the limits of his role on the team. Even the most beloved coach is a dictator, and Dunga was always splendid authoritarian material. If childhood friends named him Dunga--and it’s true, with age, his drooping cheeks can sometimes resemble that of Snow White’s pint-sized companion-- the Brazilian press took up the cause of tormenting the man. His World Cup winning side in 1994 was calibrated towards ruthless pragmatism--a response to the country’s decades-long drought in the tournament--but Dunga unfairly bore the brunt of criticism of the style-less triumph in Los Angeles. Of course, Dunga could be outrageously vocal in championing the cause of efficiency. In interviews, he would trash Tele Santana and his sublimely doomed sides of the eighties, which were truly the perfect avatars of joga bonito. This earned him enemies among alumni of that team, who were not just great heroes, but pundits themselves. Socrates, my favorite Brazilian player of all-time, likes to chide Dunga as “bureaucratic” and “reactionary.” Still, the design of that 1994 team wasn’t his. That approach was ordered by the victory-starved football federation. Dunga was just the guy who made it work. So, does Dunga deserve his deserve his reputation as the man who destroyed the Brazilian game? I’m pleased to report that joga bonito is always dying in the eyes of the media. Certainly, that’s what the media said back in 1994 after that utilitarian triumph--and in 2002, when a Brazilian mob burned Luiz Filipe Scolari in effigy for the damage he inflicted on the soul of the selecão. And would anyone claim that the last installment of Brazil was a thing of amazing beauty? Dugna has made a fetish of pragmatism and solidarity. He has shunned Ronaldinho for failing to comply with his tactical directives. He has a preference for evangelical players with Calvinist work habits. Still, I think, it’s unfair to single him out for turning the course of Brazilian history. In fact, I expect that this team will ultimately be more stylish than many of its recent predecessors. Dunga’s twin holding midfielders and deep backline are the platform on which skilled players have the freedom to do their thing. Brazil can already claim to have scored several of the tournament’s sweetest goals. Yet, Dunga will keep baiting his critics, daring them to blame him. This is a storyline that he requires for hematological reasons. A lifetime of being Dopey will do that to you.